This Extra Large Woodland outdoor Log Set is perfect for the 37", 48" Fire Pit or Larger. This New Style Log Set looks very natural on a Fire Pit with partially charred looking pieces. This log set is made of ceramic fiber for outdoor use however; it can also be used indoors to replace an existing Extra Large Log Set. 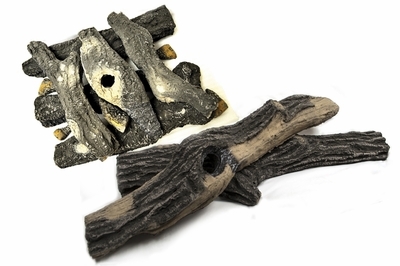 Designed specifically for the outdoors, these logs have a weathered look of Gray and Black and they develop a glow where the flame is hottest. 8 Piece Woodland Outdoor Log Set is perfect for the 36" and 48" Fire Ring.